When your bloodwork comes in, we encourage you to set up an action plan, a self-selected tool to improve your health from the inside out. You will also see a "goal optimization score" and a timeline for when you should retest. Your goal optimization score is based on your levels of the biomarkers associated with your goal. Depending on the results, you may have very little, or maybe quite a bit, of work to do in order to become fully optimized. Next, we take this score, the daily actions you’ve chosen, and our broad scientific literature database to develop a personalized timeline. This timeline lets you know how long you should stick to your action plan before retesting to see what progress you've made in reaching your chosen goal. Having multiple blood test results can add invaluable information to your InsideTracker account. It can help you establish a true baseline for your values to more accurately assess when you have increased or decreased a biomarker. It can also allow us to analyze if a recommendation is making an impact on your biomarker, which will allow us to further personalize future action plans. A very important note here: you should always create an action plan using the most up-to-date blood work in order to improve your health as it is now, not how it was a few months ago. Have you rotated your tires lately? You’ve never compared your body to a car before? They are more alike than you think! Today the average lifespan of our vehicles is at an all-time high of 11.5 years, which is almost double that of the vehicles made in the early 1970s.4 The research shows that the relatively new practice of routine maintenance, every 5000 miles or so, has greatly improved engine power output and durability, optimized vehicle performance, and significantly increased the vehicle lifespan.5 Checking under the hood and making adjustments before there are big problems has drastically protected the investment of the car. Applying this logic to ourselves, periodically measuring our blood biomarkers can provide the same objective analysis and opportunity to correct small imbalances or issues before they become larger problems. It also gives us the chance to fine tune our bodies to run at our optimal potential. Just like our cars, our bodies’ needs change as we put more mileage on our lives. The types of damage incurred and repairs needed a change from check-up to check-up. Not only will you be wasting money on things that may not need to be fixed, but you’ll miss out on fixing new issues. When you use old blood work, you run the risk of potentially receiving recommendations that are no longer relevant, applicable, or safe for your current biochemistry. For example, you may have required a supplement last year, but your blood work doesn’t show a need for one now. Or a dietary suggestion may have made sense before, like red meat to improve iron, but now red meat should be limited due to cholesterol. On the flip side, you may be trying to optimize a biomarker or goal that you have already achieved! At InsideTracker, our goal is optimization, for ourselves, our platform, and especially for our customers. Whether you’re an elite athlete, recreational mover, or just getting started, we want to provide you with the most accurate recommendations and lifestyle choices that will help you not only achieve, but exceed, your goals. And to do this, we need your help. Help us, help you! Our team pores over the science to ensure all of our recommendations are backed by the most up-to-date scientific research. If you aren’t seeing the result you want, feeling your best, or totally satisfied with your InsideTracker experience you may want to take a look at the date of your most recent blood test. The more current the blood work (aka the fuel) the more relevant, accurate, and actionable you’ll find our recommendations. This is why we give you a timeline for when you should retest, reminders to retest, and recommendations that include retesting. To further incentivize, there’s also an option to buy multiple tests at once for a discounted price. We know the price of a test isn’t cheap, that’s why we also have a DIY option to upload new blood data from your physician. 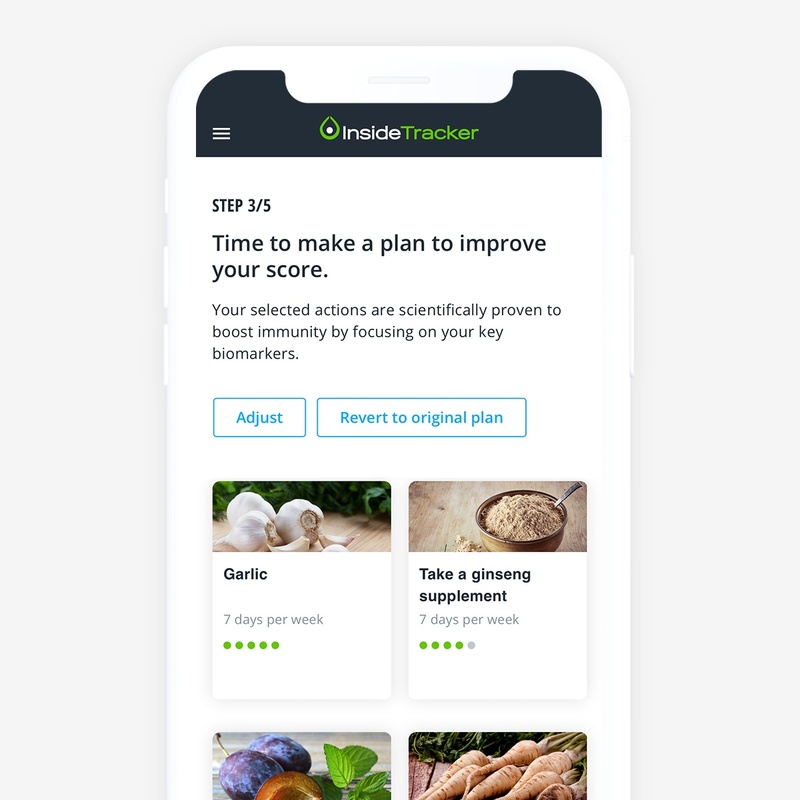 So, if you’re looking to get the most out of your InsideTracker experience, and become your most optimized self... RETEST RETEST RETEST….and give your body the fuel it needs to run in tip-top shape. 1. Mayeux R. Biomarkers: Potential Uses and Limitation. NeuroRx. 1(2), 182-8 (2004). 2. Hagander B, Asp NG, et al. Dietary fiber decreases fasting blood glucose levels and plasma LDL concentration in noninsulin-dependent diabetes mellitus patients. Am J Clin Nutr. 47(5), 852-8 (1998). 3. Dibaba DT, Xun P, et al. Dietary magnesium intake is inversely associated with serum C-reactive protein levels: meta-analysis and systematic review. Eur J Clin Nutr. 68(4), 510-6 (2014). 5. Hardie C, Tait H, Craig S, Chase JG, Smith BW, Harris G. Automated tuning of an engine management unit for an automotive engine. Proc Instn Mech Engrs. 216(D), 841-49 (2002).